As long as there are weddings, there will always be couples who are looking to find unique ways to honor their loved ones throughout their wedding ceremony. However, I can't say that I've ever seen this done quite on the scale of a “Day of the Dead” celebration. Captured beautifully through the lens of SY Photography, and with wedding design and styling by Eclectic Fête, the design aesthetic of this shoot was to take a completely non-traditional spin on a wedding in an urban setting. From the designer, "As most of those close to me know, the “Day of the Dead” is definitely a holiday that I hold near and dear! I just love how Latin American cultures unapologetically celebrate the lives of the deceased." Get ready for what I like to call, "wow-worthy event design!" First things first, make up and hair! As you will see throughout the shoot, the hairstyling by Terry Gregorik really makes a statement! 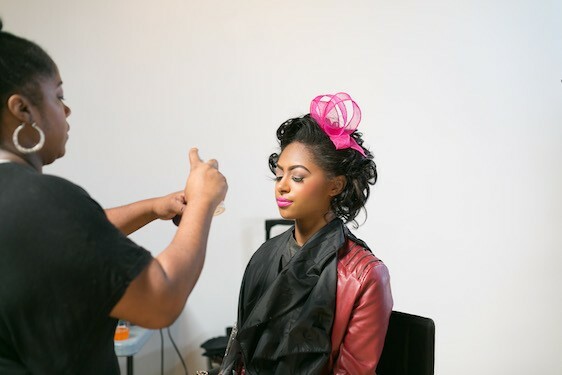 Not to mention the gorgeous makeup artistry by Life + Beauty Rehab! Gorgeous models, check! Hair and makeup, check! Accessories, check! So many amazing wedding professionals came together to make this shoot happen! I'm just loving this industrial space and the whole idea of bring nature inside! The design concept behind this shoot juxtaposes the darkness that shrouds death with the celebration of love and life exemplified in a wedding and in the Day of the Dead festival. From the design team, "We contrasted light and dark elements in a funky, unique venue using lush fabrics, vivid décor pieces and lavish florals by EightTreeStreet ." Such a colorful day! The paper floral backdrop created by Paper + Peony really stole the show! And of course with any good celebration, the food and drink are completely crucial! Festive touches galore, plus so many amazing nods to the Latin American culture! And the result? An amazing event design worthy of recreating! More from the designer team, "The entire concept of giving life to death intrigued me—especially because of the vibrancy of the celebration." "Latin Americans have a completely different idea of how to reverence the lives of the deceased." For the Latin American culture, The Day of the Dead is all about celebration! You can just feel the love! Got to give it up for Amphora Catering! The food looks amazing! And how about this amazing cake artistry by Amphora Bakery? And plenty of colorful touches? Where do I sign up? So many amazing details in this shoot! I especially love these shots in the elevator! Such a stylish vignette and I just love the unexpected location! Huge hugs and high fives go out to all of the fabulous wedding professionals who came together to help make this amazing shoot come to life! Everything turned out exquisite and I really enjoyed seeing this non-traditional theme explored! Also can we just talk about some of the standouts? The models were absolutely stunning, the floral design by EightTreeStreet was over-the-top gorgeous, and the paper flowers by Paper + Peony absolutely stole my heart. This is truly an amazing example of what happens when event professionals are given the creative freedom to show their stuff and it's really exciting to see the envelope pushed when it comes to themes, and culture. Now, you'll have to excuse me, because I have some major pinning to take care of! Care to join me? No Comment to " Day of the Dead Wedding Inspiration "